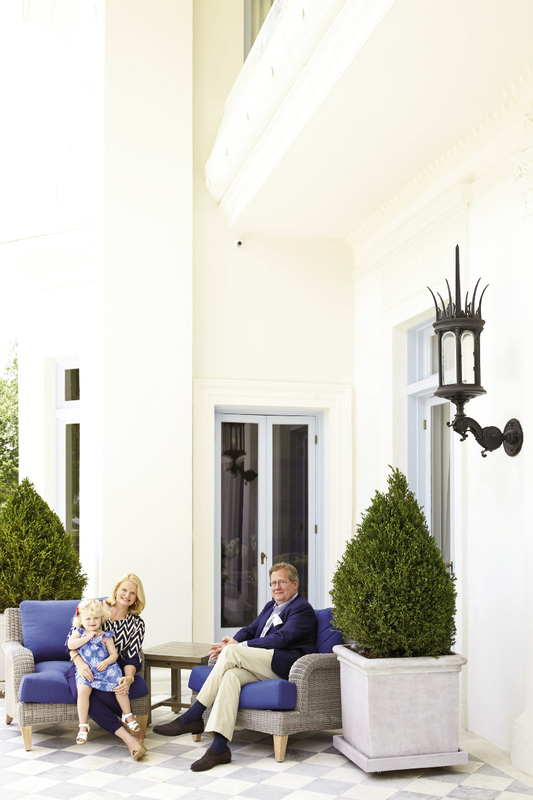 Stephen and Mary Hammond (pictured here with two-and-a-half-year-old Marilen) revived the famed villa, restoring the flow and grandeur it boasted before becoming a hotel. 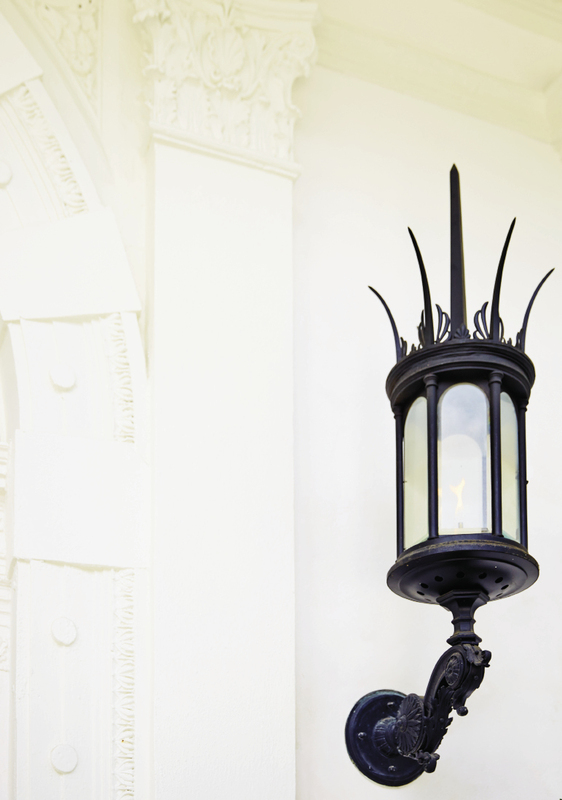 The Silver Vault of Charleston painstakingly restored the home’s original gas lanterns. 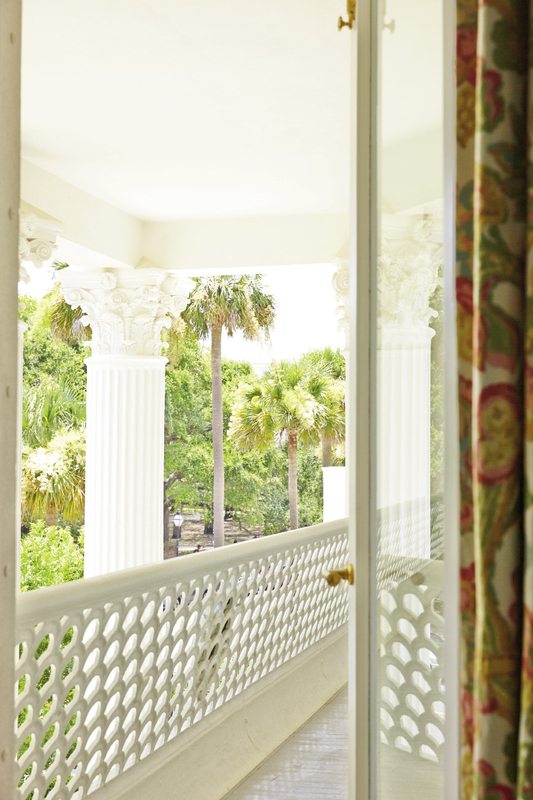 The ironwork screen on the second-floor balcony was repaired and restored, The columns required major repairs as well. The ornate capitals, which were “crumbling to the touch,” according to architect Eddie Fava, were reproduced with traditional methods and plaster to match the originals. 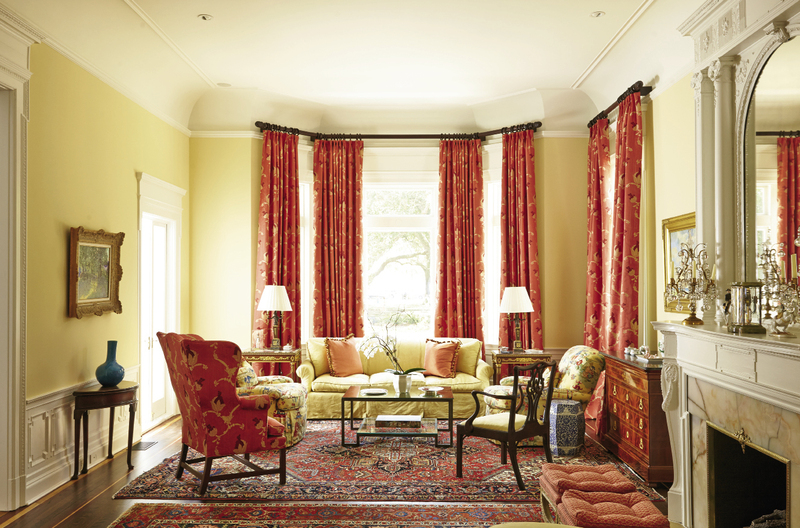 Interior designer Carolyn Griffith ensured the living room’s formality was still comfortably family-friendly. The fireplace surround and mirror are original. A brochure from the time Villa Margherita served as a hotel (1905-1953) hosting notable guests such as Eleanor Roosevelt, Sinclair Lewis, and Gertrude Stein. “The ballroom, with that volume and space, is pretty spectacular,” says Eddie Fava, but it suffered the most damage. 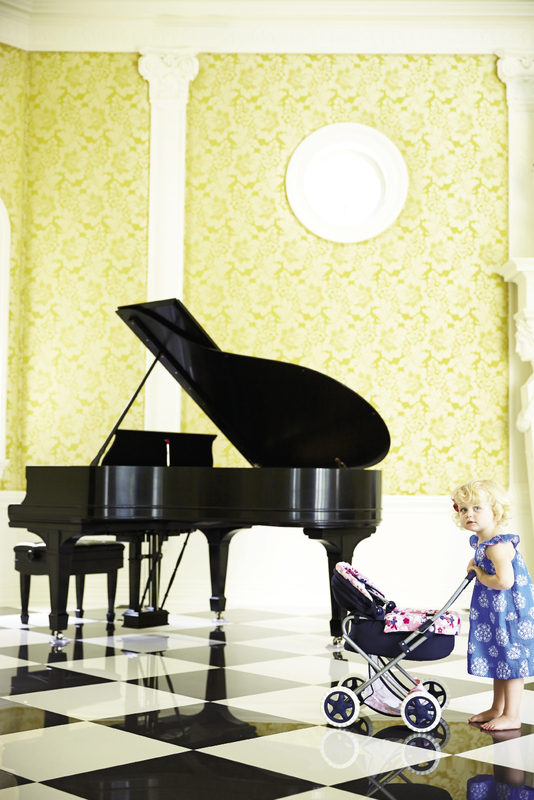 Now polished and stately, the walls wear a fine Lee Jofa fabric, and a grand piano complements the marble floor. 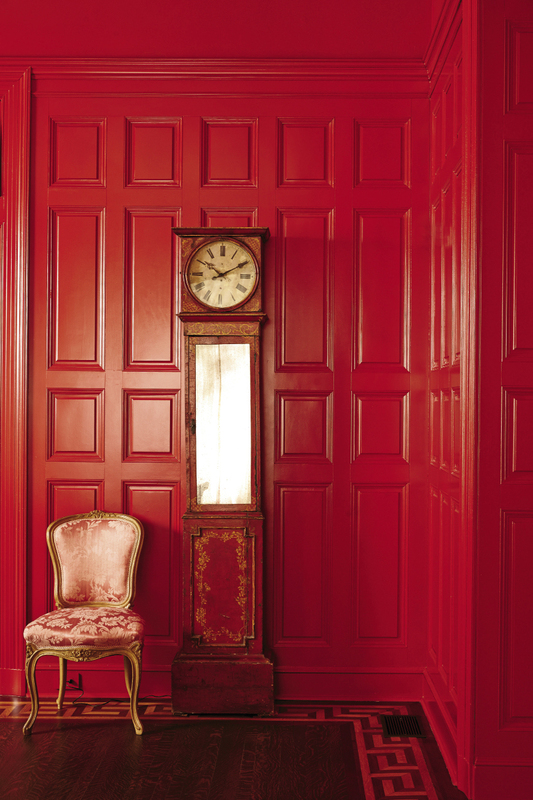 A rich, warm red jazzes up the formal paneling in the dining room. 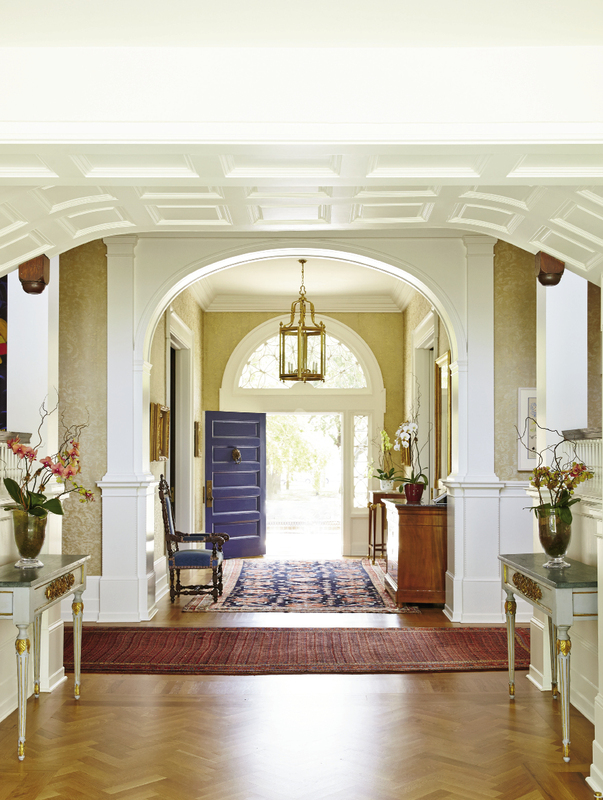 French antiques juxtaposed with modern art add global flavor to the Italianate residence. 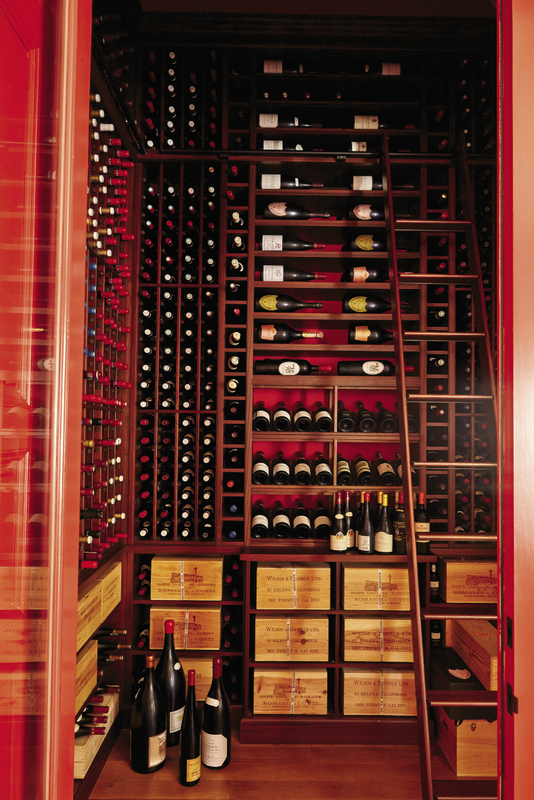 Stephen’s prized wine collection is both showcased and handy. 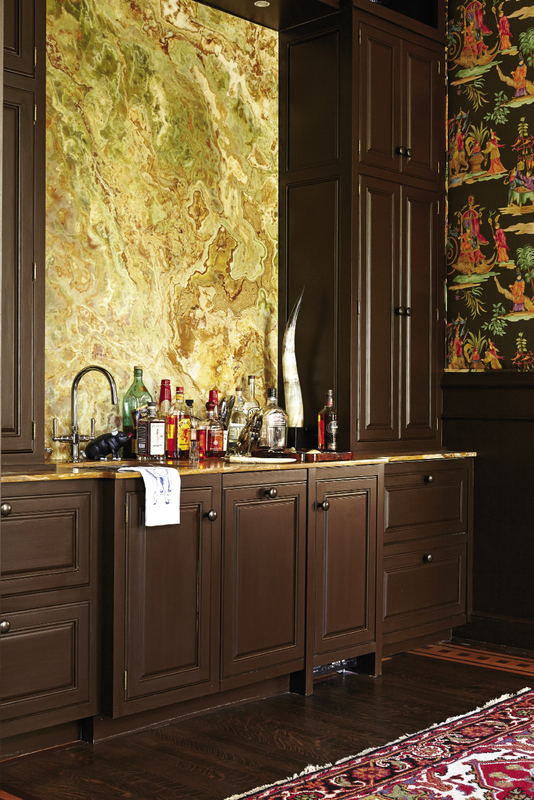 Russian onyx marble headlines the bar—formerly an anteroom. The view from the dining room to the formal living room crosses two anterooms and the foyer. 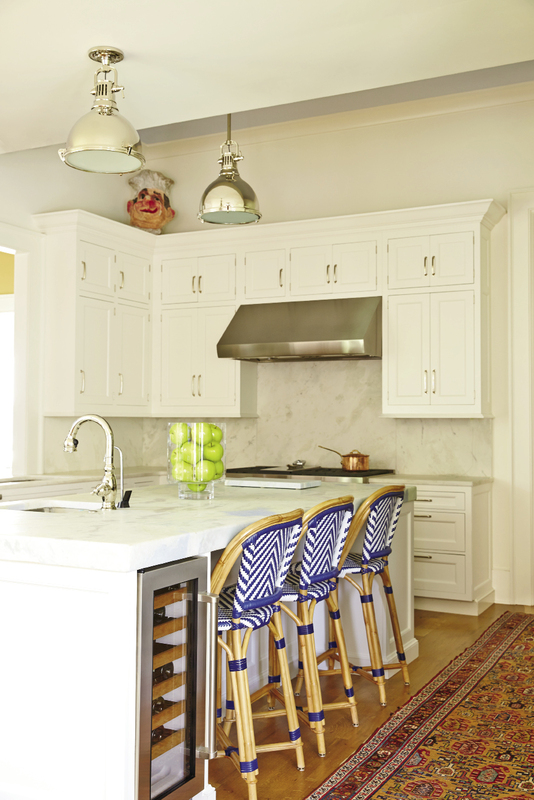 Custom Wood-Mode cabinets offer streamlined storage in the classic white-on-white kitchen, as well as in the adjacent casual family living space. A wall of new floor-to-ceiling windows opens up the kitchen/breakfast/family room to bright morning light and garden views, as well as a peek-a-boo of the harbor to the east. 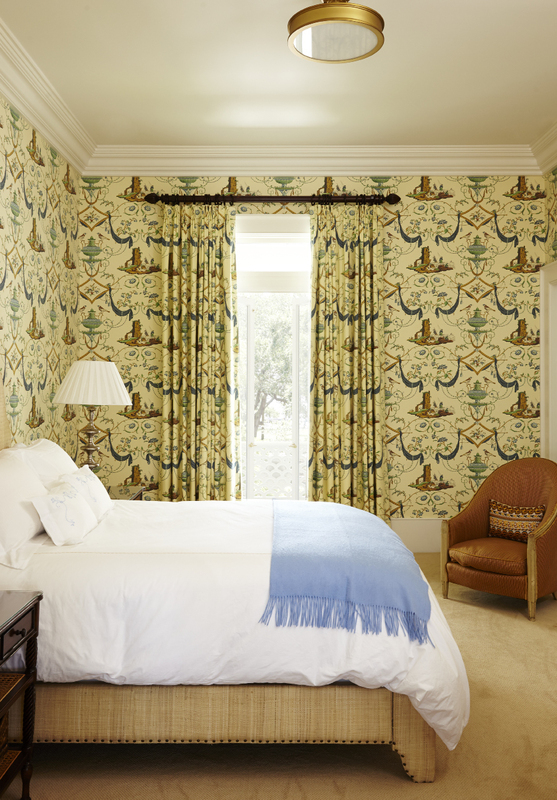 A guest room on the second floor offers prime White Point Garden views. The architect fashioned a new stairwell to the attic, making the space a usable and spunky playroom for Marilen and baby sister Julia. Landscape architect Sheila Wertimer replaced a shallow pool with a classic courtyard, featuring large pots of citrus and rosemary framing a centerpiece fountain. 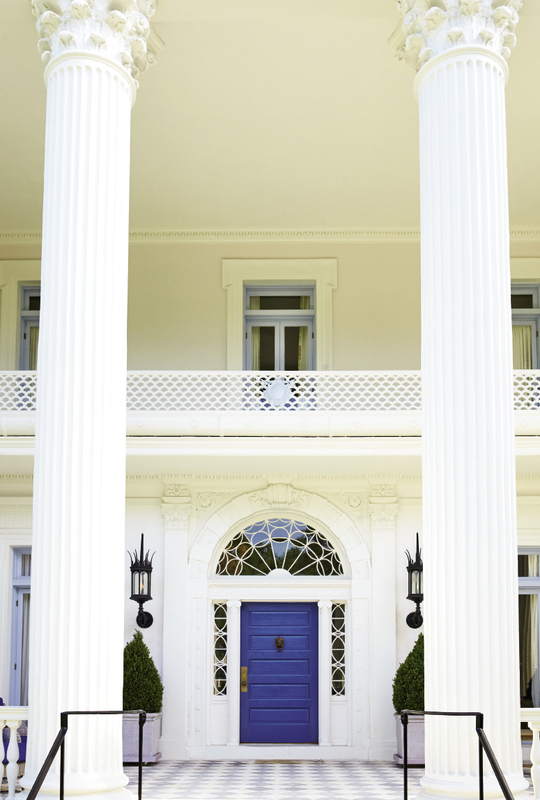 Many Charleston homes wow with their “good bones,” their strong architectural integrity and classic lines. Others boast a distinguished pedigree and historical gravitas, thanks to so-and-so-president or famous person who once stayed there. Some offer intrigue due to quirky tales or the colorful characters of former residents—the juicy fodder that fiction-prone tour guides love to embellish. But rare is the Charleston residence that can claim all of the above. And undeniably, the Villa Margherita is exceptional. 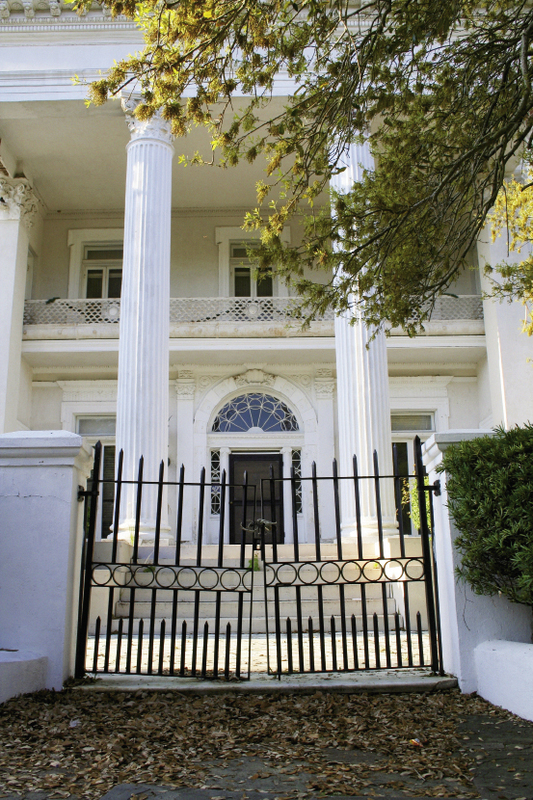 The venerable columned manse, once a renowned hotel and now the newly spiffed up home of Stephen and Mary Hammond, has all this in spades, plus that truly rare Charleston element: a basement. For the more recent decades of its storied 120-year history, however, Villa Margherita was perhaps most noteworthy for its wilting grandeur, its obvious giving way to the inevitabilities of time and entropy. 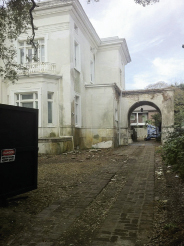 While the primo properties surrounding this South Battery beauty were getting makeovers and TLC, the villa sat defiant in neglect. She whispered a reminder that there can be elegance in unvarnished reality, honor in wrinkled old age. 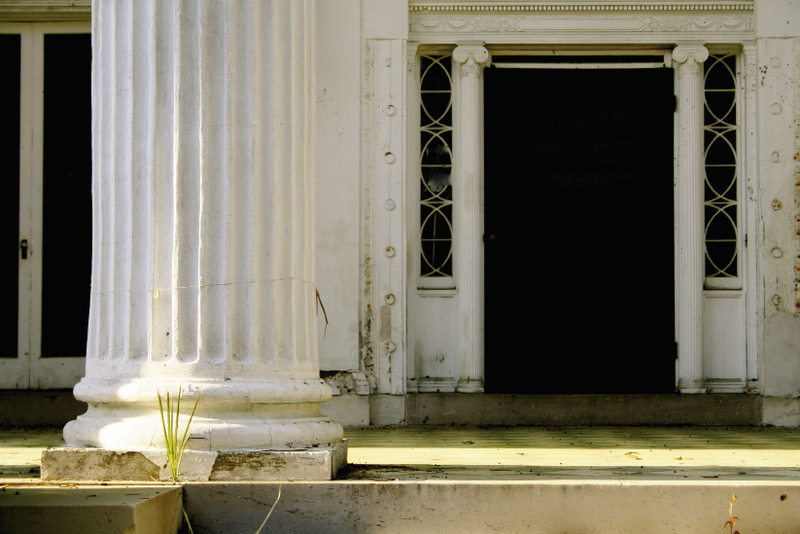 We watched as her paint chipped, her columns crumbled, her once-proud, balustraded brow drooped and sagged. We recognized a bit of ourselves in her decline and wished it were otherwise. 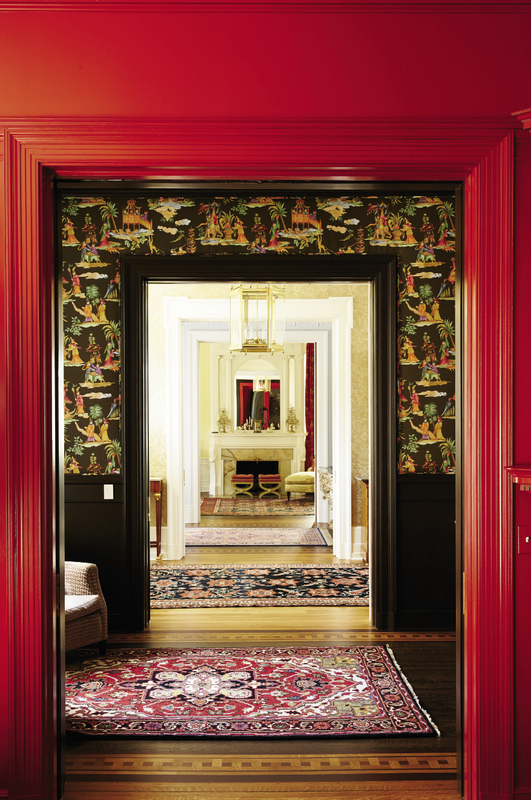 “We were always drawn to this house—it had such mystery, such strong presence,” says homeowner Stephen Hammond. “We’d had our eye on it for years but were told the owner had no intention of selling.” A native New Yorker (“he’d only lived in apartments his whole life,” says his wife, Mary, noting the contrast to their spacious abode), Stephen had traveled regularly to and even lived part-time in Charleston, where his mother has a home and their family business, Lou Hammond and Associates, has an office. In 2011, he and Mary, now the marketing director for Garden & Gun magazine, moved here full-time, hoping to start a family and raise kids in a slower-paced place. They lived on nearby Tradd Street initially, but kept searching for a home they could make their own and grow into. Again and again, they came back to this property, lured by its handsome stature and ideal location overlooking White Point Garden and the harbor, as well as by curiosity about what surprises it held inside (no one had seen it in years) and dreams of what it could be again. The Hammonds made repeated inquiries, to no avail. Contrary to outward appearances, the villa had not been vacant all those years. 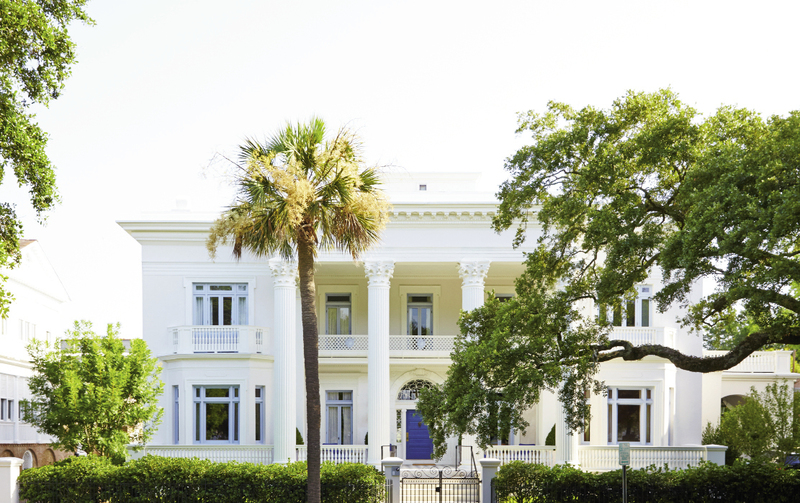 The owner, Dr. Mary B. Wilson, a pathologist at MUSC who had grown up in the house and inherited it from her parents, lived there, but only in an upstairs apartment. The bulk of the house she had closed off—it was simply too much for her to keep up. Before going into medicine later in life, Wilson studied at Winterthur and had a career in American decorative arts in Philadelphia. She knew and appreciated the artistry of her home and feared that if sold, it risked being chopped up and turned into condos or a B&B. In a way, she wasn’t neglecting as much as protecting it, by the only means she could—by holding on. But the Hammonds held on to their dream, too, and patience and persistence ultimately paid off. “We wrote her a letter, assuring her we would keep it as a single-family home and only wanted to return it to its original state, to raise our kids here,” says Mary. In 2012, Wilson agreed to sell, and Villa Margherita changed hands for only the third time. Built in 1895 for Daisy and Andrew Simonds (we’ll come back to them) and designed by Frederick Dinkelberg (an architect most famous for his work on the Flatiron Building in Manhattan), the turn-of-the-century Beaux Arts-style home is “a mere baby in this town,” says Mary. But it’s a big baby, complete with a grand ballroom; soaring 17-foot ceilings with dazzling original crown moulding; a courtyard with a pool (which the Hammonds removed, and which tour guides routinely and incorrectly claim was Charleston’s first “indoor” pool); formal ante rooms; and despite its generous dimensions, an easy, natural flow. “That’s been the nicest surprise, how comfortable and functional it is for family living,” Mary adds. On the brighter side, the “house had just been neglected, not duct-taped or chopped up or patched,” he continues, so there were no hack jobs to undo. And the fact that the mansion had a full basement meant that updating and adding HVAC and plumbing, which the long-shuttered structure direly needed, was possible without significantly impacting ceilings or walls. The Hammonds assembled a top-notch crew led by architect Eddie Fava and his team at e.e. fava architects, including NBM Construction, which handled the renovation of the Dock Street Theatre; Signature Kitchens & Baths for all the custom millwork; and an army of local craftsmen to do intricate repair of damaged moulding and plaster. 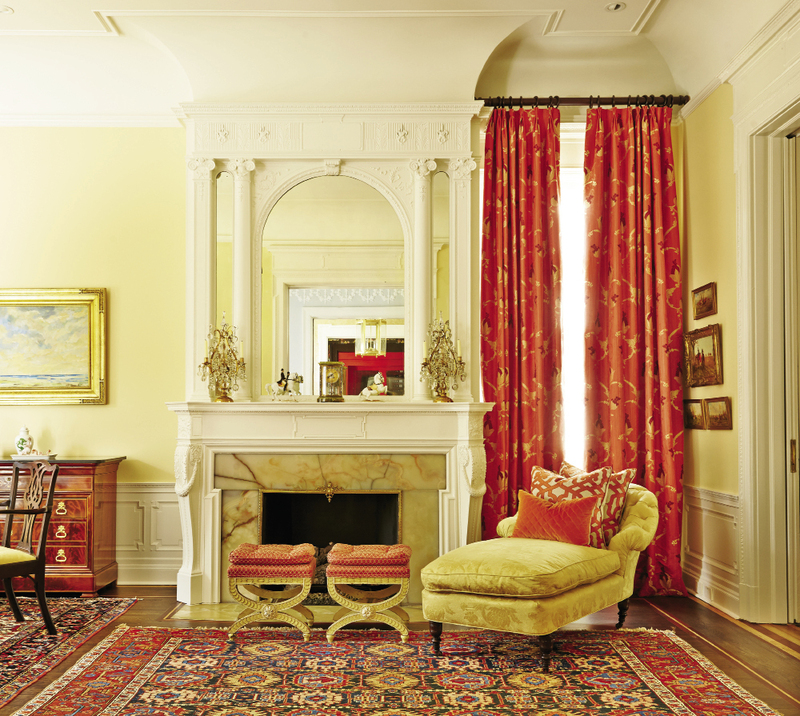 Interior designer Carolyn Griffith refined color palettes; lighting (all new chandeliers, most from an antique dealer friend of Stephen’s in New Orleans); and fabrics, including the lush fabric-covered walls in the bar and ballroom (which softened the room’s acoustics). 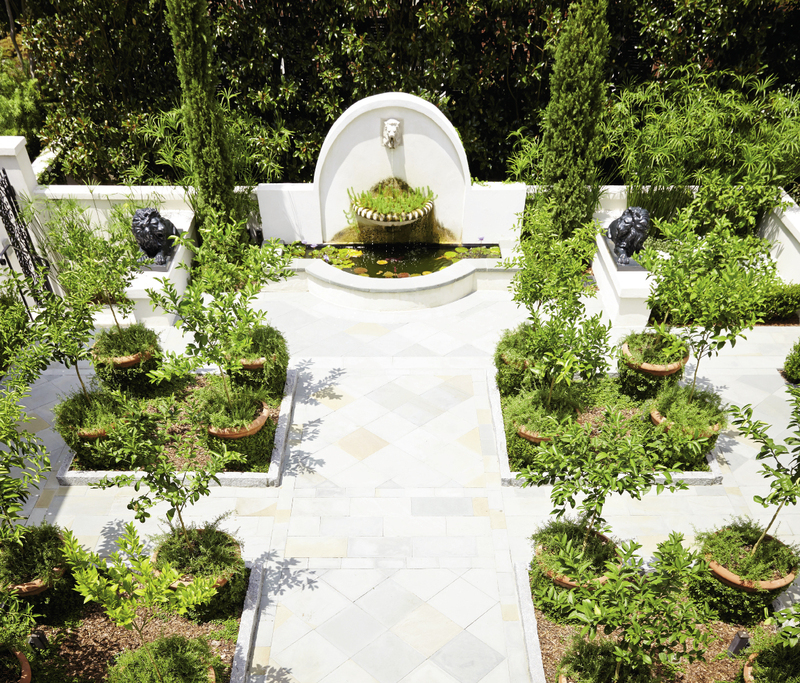 And outdoors, Sheila Wertimer transformed “an overgrown rainforest with bamboo 20 feet high” into a hydrangea garden on the east side and created a formal Italian-style courtyard of potted citrus where the shallow marble pool once was at the rear of the property. Now regarding the “soul” of the house—that takes us back to its original owners, to Daisy and her husband, Andrew Simonds Jr., who was vice president of the National Bank of South Carolina. Andrew’s father, who lived a few doors down, was the bank president and, as a wedding gift, had given his namesake and new daughter-in-law a single house that formerly stood at 4 South Battery. But that house wasn’t quite grand enough for Daisy. “She evidently loved to live life to the fullest,” says Mary. Indeed, “Daisy” was this New Orleans debutante’s nickname. Her given name was Margaret Rose Anthony Julia Josephine Catherine Cornelia Donovan O’Donovan Breaux. And with a name like that, you almost have to live an outsized life, as Daisy did, in her extravagant outsized manor. She insisted on the finest (the home’s classical frieze is vintage Morrison Brothers, who also made the decorations for New York’s Madison Square Garden) and entertained to the hilt. “Seeing the ballroom for the first time blew us away. In its original iteration, it was quite the party house,” says Fava. Indeed, in the Hammonds’ thoughtful revival of this Renaissance Revival landmark, warmth trumps austerity and comfort overrules formality. 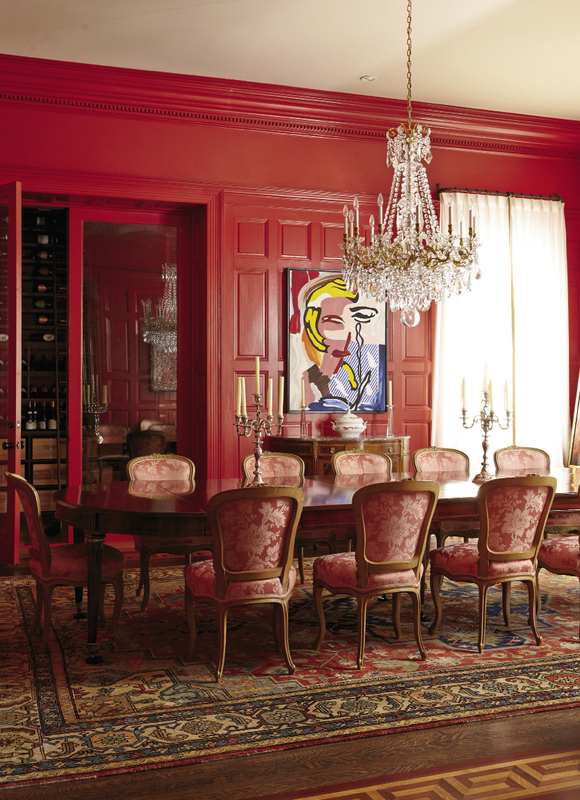 Marilen’s Little Tykes car makes tracks around the ballroom; modern art hangs on traditional paneled dining room walls boldly painted bright red (“Stephen’s idea; he’s the color guy,” says Mary, who was dubious but now loves the hue). 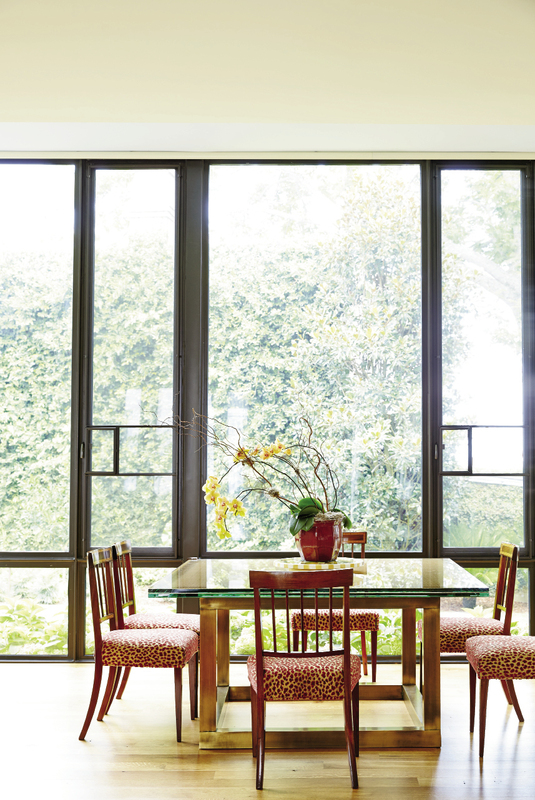 Everywhere there’s a balance of contemporary and classical—a sleek glassed-in solarium adds a new link connecting a totally redone kitchen/family room with the ballroom. Nothing is too highfalutin or stuffy, nothing is too sacred, except of course, room for family. “It’s hard to say what I love most about it,” Mary says. “I love the sense of flow, of space, of light. I love watching our daughter play and explore in all the rooms. It makes me happy every day.” And you get the sense that both Daisy and Mary Wilson would be happy too: one happy that the opulent gilt is once again gilded, and the other that a young family is putting down roots here, with a garden and a groovy playroom. And the house itself even seems to smile, with the ironwork screen on the second-floor balcony repaired and restored, no longer languishing in a frown. 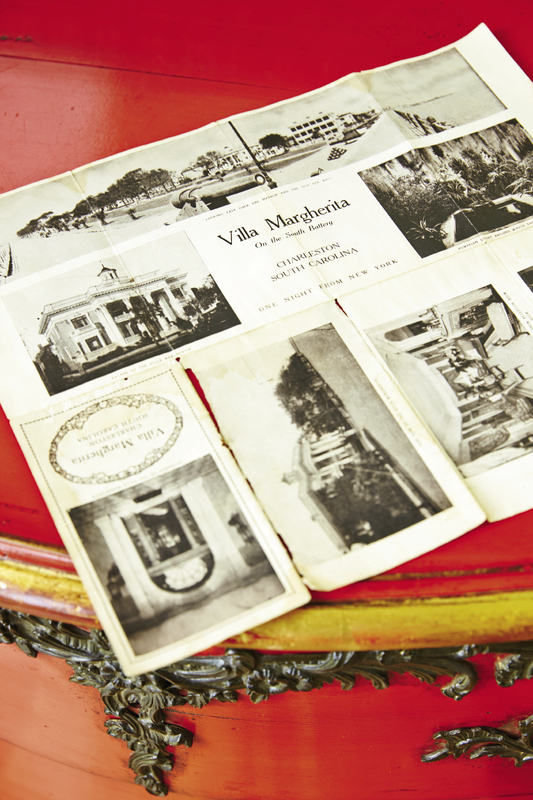 Indeed, with plenty of TLC, plaster repair, and new plumbing, among other contractor miracles, ruin is averted and the Villa Margherita is revived and real again. 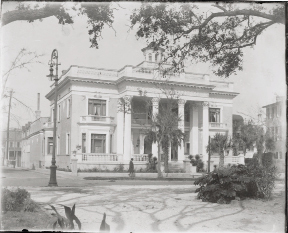 Daisy Breaux Simonds was known for entertaining lavishly and hosting high-profile guests, including President Roosevelt when he visited Charleston for the West India Exposition in 1902. 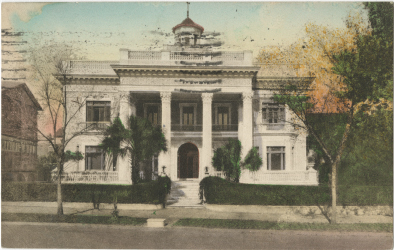 However, when her husband, an alcoholic, died in a Baltimore sanitarium in 1905, she had to become resourceful and turned her home into a European-style upscale inn, naming it after herself—“Margherita” is Italian for “daisy.” Daisy remarried a wealthy New Jersey banker in 1907 and moved to Princeton, then later to Washington, D.C., with husband number three, but her villa remained a hotel from 1905 to 1953, including a three-year window from 1943 to 1946 when the United Seaman’s Service leased it to house seamen and their families.